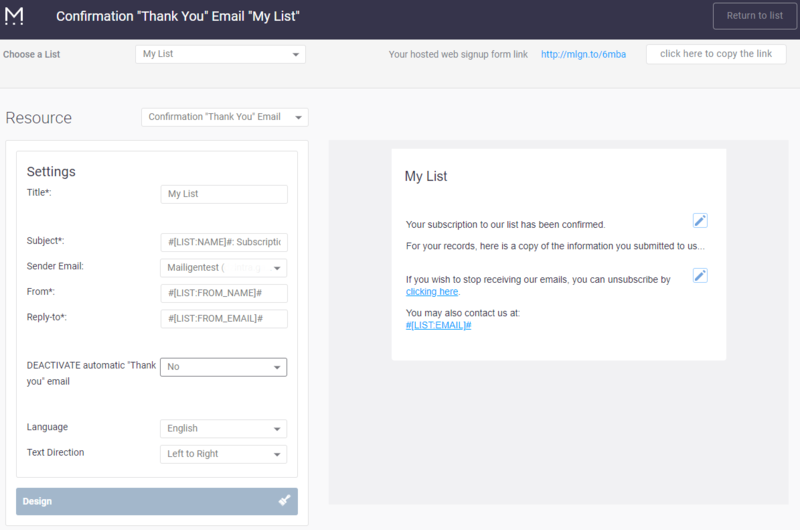 The Confirmation Thank You Email is sent to subscribers after they have confirmed their subscription to your list. The first step is to select the Confirmation “Thank You” Email from the Mailing List Drop Down. After you have selected the Confirmation “Thank You” Email you can make changes to the behaviour or design of your page through the Resource Settings section or the Design Settings section. Subject—the subject of the email. 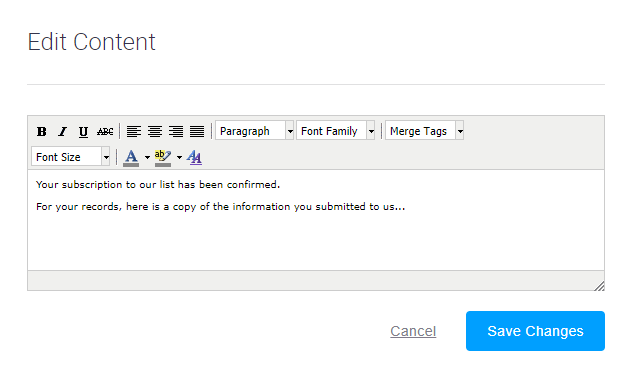 This is auto-populated with the merge field representing the first and last name of the subscriber and a default subject. Reply-To—the reply-to address of the sender. This is auto-populated with a merge tag of the Sender's Email address currently selected for your list. DEACTIVATE automatic "Thank you" email—choose "YES" if you want to turn off the "thank you" email. Language—use the drop-down to select the language for the email. The WYSIWYG panel shows you a real-time representation of your form or email as you are working on it. Changes you make to fields, labels, colors, sizes, images, etc. are reflected as you make them.